Arthroscopic procedures, which reduce healing times because cameras are used to minimize cutting. Fusions to create a more stable joint. Internal fixations, as in holding together a broken joint temporarily with pins and screws. Joint replacements that are either partial, total or a revision of a previous surgery. Repair of soft tissue, such as torn ligaments or tendons. Arthroscopic procedures have been developed over the years as a way to minimize the need for opening up a patient. The goal is to perform the surgery with as few incisions as possible. This reduces healing times and even results in patients having surgical procedures done and going home on the same day. 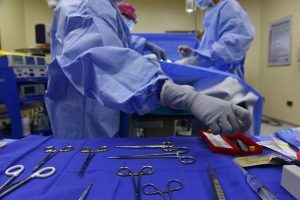 The most common body parts treated with orthopedic surgeries using arthroscopic techniques to repair damaged ligaments, tendons, and soft tissue tears include the knees, shoulders, wrists, and hips. Fusions are generally done in the spine—specifically when there is degenerative disc disease present. Fusing two (and sometimes more) vertebrae together helps keep the area of the spine fused more stable. Ankles are a common place where internal fixations are used, but surgeons use pins and screws throughout the body to ensure that a broken joint heals correctly. The most commonly performed joint replacement surgery is for the knee, followed closely by hip replacement surgery. Knee replacement surgery includes either a partial knee replacement (where only one side of the knee is repaired), a full knee replacement (where a complete prosthetic device is implanted) or a revision surgery of a previously implanted device. Soft tissue surgeries are performed most commonly on the knee, followed by the wrist, shoulders and elbows. The time needed to heal from orthopedic surgery will vary from patient to patient, but with the use of arthroscopic techniques, many patients find that they are able to become mobile again quickly. While patients aren’t generally 100 percent healthy right away, a commitment to physical therapy and following through with all treatment options helps patients get back their busy daily lives once again. Our team of experienced Florida orthopedic doctors and physical therapists at Southeast Orthopedic Specialists can design a treatment and rehabilitation program that can get you moving again without pain. Call us or contact us online today to schedule an appointment!